Keyword research is the process of discovering what your customers are searching for in order to optimize and increase content visibility on the search engine results pages. It’s one of the most important and high return activities in SEO and should be conducted on an on-going basis. So Tell Me, What Are The Benefits? The benefits of conducting in-depth and effective keyword research are immeasurable. Not all keywords drive you quality traffic. But some do. In fact, some high value keywords can potentially drive dozens of eager buyers to your site on a monthly basis. So imagine how much you might lose out if your keyword research process wasn’t thorough enough. So what are some measurable benefits that come with effective and in-depth keyword research? Just by looking at the incoming search terms to your site, you’ll be able to tell what kinds of people are searching for your products and services and what they’re hoping to find. Someone searching for “how to shoot beautiful photos” may not necessary be interested in buying a camera, but rather looking for expert tips on taking pretty pictures. On the other hand, someone searching for “best cameras for shooting outdoor scenary” may be in the comparison phase and would need detailed comparisons on various camera brands before deciding what to buy, whereas someone searching for “second hand canon eos6d cheap” literally has their wallet out. For the first scenario “how to shoot beautiful photos”, we can guess that this person might have already bought a camera and is keen on learning how to shoot beautiful photos, though he/she may not necessarily own the best camera available in the market. Armed with this information, we can then create a piece of content, say, “How to Shoot Amazing Photos For Beginners”. In this article, we could provide excellent lighting tips on how to shoot beautiful photos even with the most basic camera, and then add that it would really pay off to get a more advanced camera e.g. a DSLR to shoot top quality photos. By empowering your readers with expert knowledge through targeting useful content to relevant search queries, you’re building their trust in your brand. It would then be much easier to sell them your products and services. Equipped with a comprehensive list of keywords, you’ll be able to make better decisions when optimizing your site by organizing your content into individual pages where multiple related keywords are optimized on each page. Here’s an example of a well-structured site. 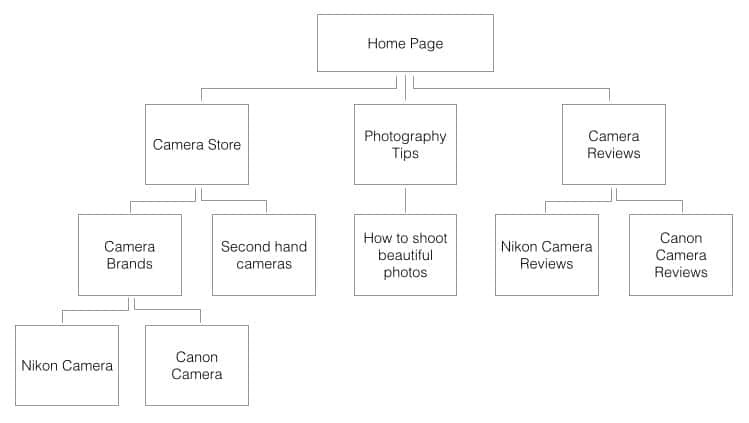 As we can see in the above diagram, “Camera Store” and “Camera Brands” should be separate pages, as combining these two topics onto one page would dilute the page’s topical relevancy and result in subpar rankings. The better practice would be to separate these two pages, including the target keywords e.g. “camera store”, “camera shop” into your “Camera Store” page and “camera brands”, “best camera brands” into your “Camera Brands” page. Why is it Important to Identify Your Buyer Personas? Not knowing who you’re marketing your business to is equivalent to firing a gun without aiming at the target board. People in different stages of the buying funnel type different search queries. As business owners and marketers, we know that customer profiles vary from age, gender, relationship status, problems faced in work and personal life, etc etc. If you don’t know who your customers are, your keyword research is going to be sloppy and incomplete, from an SEO perspective. Note: To get the above data, you can conduct market survey, purchase statistical data, and analyze existing customer enquiries and profiles. Let’s use the second example – the Event planners. To really understand the needs of an event planner, we have to think like one of them. Ask yourself these questions or hold a discussion with anyone who’s throwing a 21st birthday party. What are their concerns and requirements? Remember, you’re an event planner now. With these ideas, we can generate some keyword-optimized content. For birthday party ideas, we could come up with a listicle “10 Birthday Party Ideas That No One Will Never Forget” and get it ranked for the search term “birthday party ideas”. As for venue and location, we should optimize our site for commonly used search terms keywords such as “event venue singapore”, “event venue for birthday parties”. Understanding your buyer personas can give you broad keyword ideas no keyword research tool can. Should we just grab the whole list of keyword ideas generated by your keyword research tool and optimize our site with them? Well you can, however you might be fighting an uphill battle. Some keywords are so competitive that it’s almost impossible to rank on the top 5 positions without some heavy off-page SEO (Content Marketing & Link Building). First we have to look into which part of the buying funnel your customers are at. Depending on their search queries, they could be in the “Awareness” stage or the “Action” stage. We refer to the AIDA funnel for this. Again, we’re going to use the venue rental example. As you can infer, “Desire” and “Action” keywords are higher value keywords as they signify a higher level of interest in a particular product or service, therefore we should focus our SEO campaign on targeting these keywords first. And then there’s short tail, long tail, and location based keywords. Typically we want to target longer tail keywords as they are generally less competitive than short tail/generic keywords. Location based keywords signify a strong interest in a particular location, so if you’re based in that location, you’ve zeroed in on your target audience. It’s widely known that keyword research tools (particularly Google Keyword Planner) aren’t fully capable of churning out a comprehensive list of keyword ideas. What are we missing out then? Let’s find out. Using another keyword research tool such as Google Suggest on the keyword term “training room rental”, we can discover new keyword ideas that would be close to impossible to find just by entering a seed keyword into Google Keyword Planner. If your training rooms were located in international plaza, your results should be one of the most relevant to the searcher. It matches the searcher intent almost a 100%. Wouldn’t it be a pity if you didn’t optimize your page for this key phrase? How strong your domain authority is (how many authoritative and relevant backlinks you have and how long your website has been around) and how competitive your industry is on Search. Meaning to say you should target less competitive keywords (possibly lower search volume keywords) if your domain authority is not strong enough. 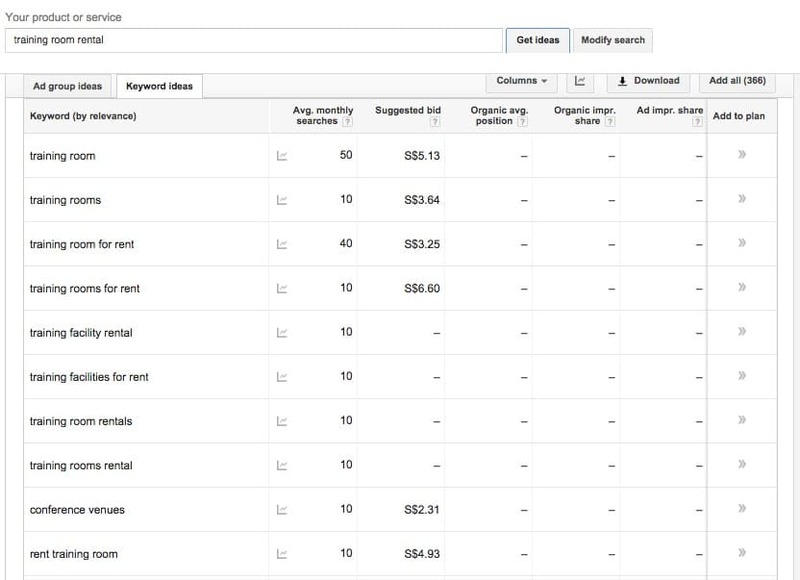 You’ll rank much faster for them compared to more competitive keywords. Which keywords have the highest chance of converting your visitors to customers (long tail, location based, branded, “Action” keywords). For the third point, you need to track your conversions through your AdWords campaigns, Webmaster Tools, and Google Analytics goal conversion data. 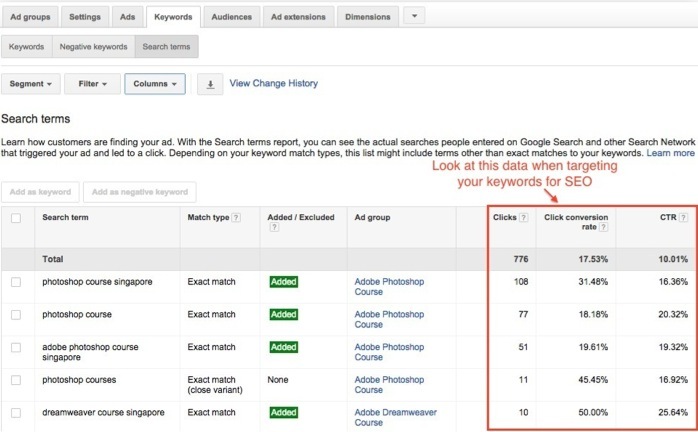 We can tell which keywords convert best. If your site is already ranking for almost all of your longtail, location based, branded, and “Action” keywords, you should move up and optimize for more generic and “Awareness” keywords, as the audience you intend to reach may not initially be interested in purchasing your products and services, but may do so in the longer term. If you’re starting out on a new business venture and you’ve just created a website, the “Best” keywords for you to target at this phase would be long tail, location-based, branded, and “Action” keywords, basically keywords that are less competitive and targeted to an audience who are more likely to convert.